Nothing makes a home feel welcoming like a refreshing scent. 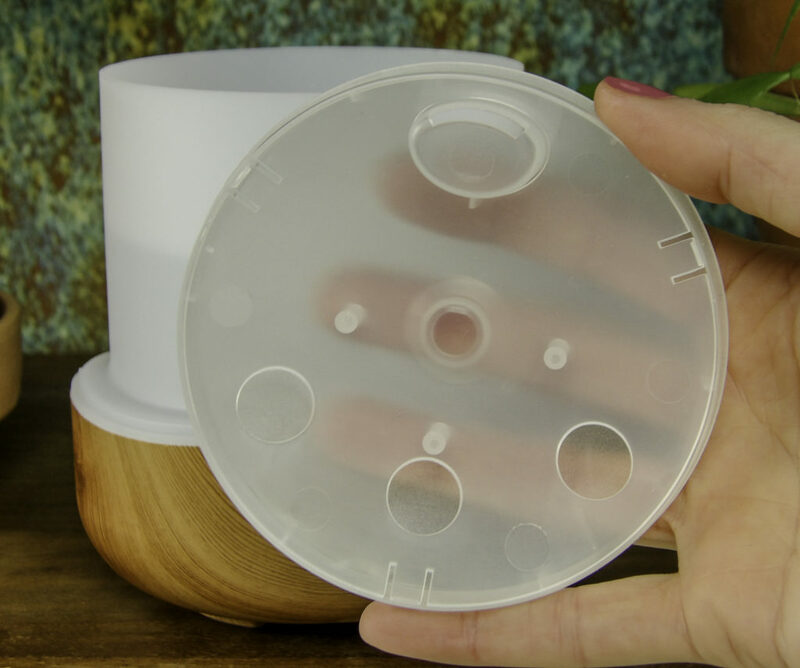 Essential oil diffusers can compensate for the lack of fresh air during the cold winter months. 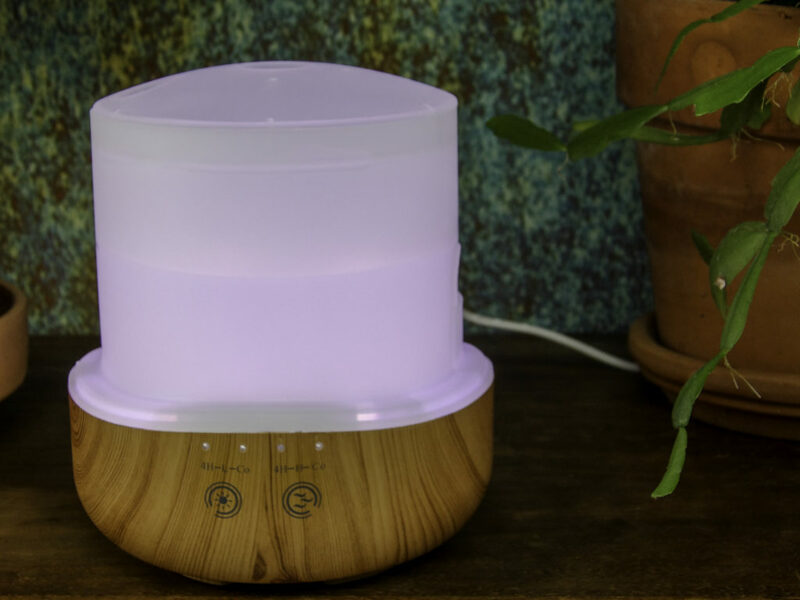 Their benefits go far beyond making the air smell better, essential oil diffusers employ aromatherapy to improve health, uplift a mood, provide valuable moisture into forced air environments, energize, improve mental clarity and cleanse the air of germs and bacteria. 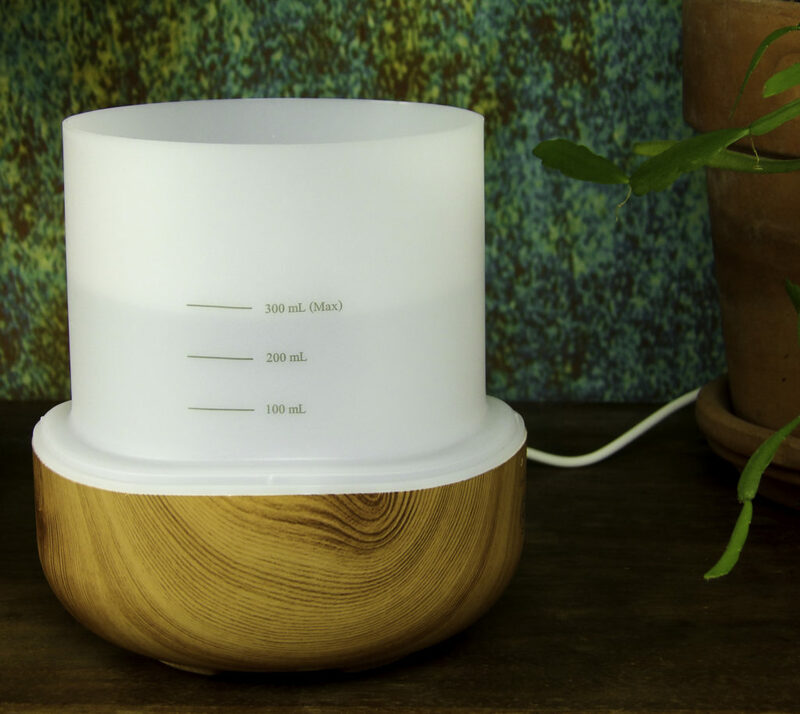 While essential oil diffusers can be a vital part of health and well-being in a home, they are also often rather unsightly. That is why we love the combination of style and function found in the TruGardens Essential Oil Diffuser. Safer than burning a scented candle, longer lasting than burning incense, and more environmentally friendly than a scented air freshener spray that propels artificial chemicals into the air, a diffuser safely and naturally adds both moisture into the air with the potent power of aromatherapy. Diffuser based Aromatherapy is safe around both pets and children. 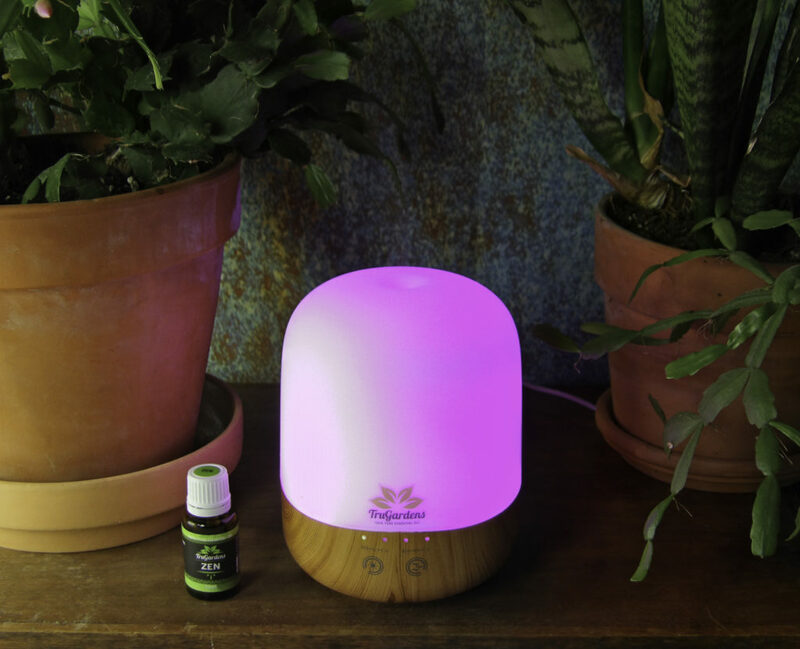 Aromatherapy via a diffuser can be used to improve a mood, but also to affect health benefits. Some benefits include diffusing Eucalyptus Essential Oil to open up congested airway passages during a cold or flu, and Tea Tree Oil to cleanse the air of bacteria, germs, and even mold. 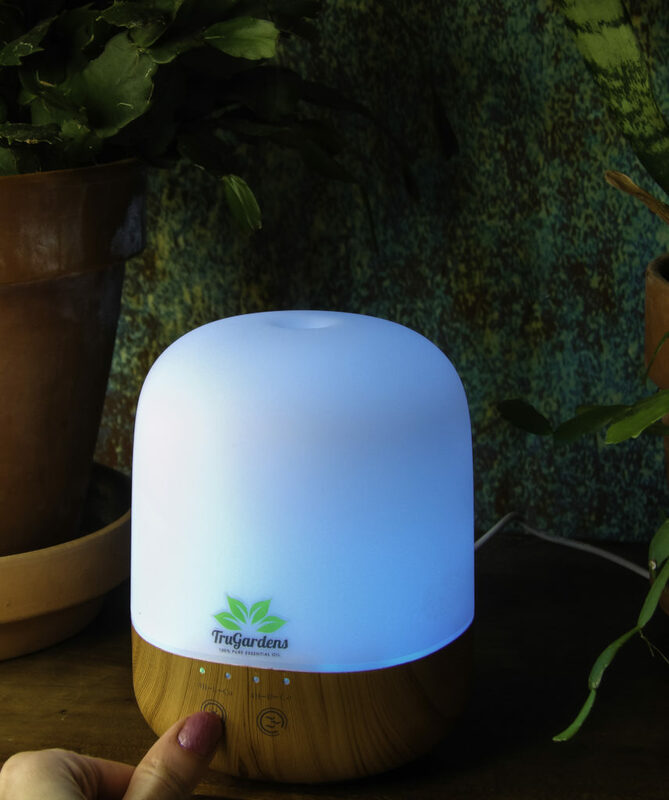 The TruGardens diffuser is suitable for home or office and boasts a number of features. First off, one notices the attractive bamboo grain base with an LED light that fits into both modern and traditional decors. It looks aesthetically pleasing but subtly blends into the decor. 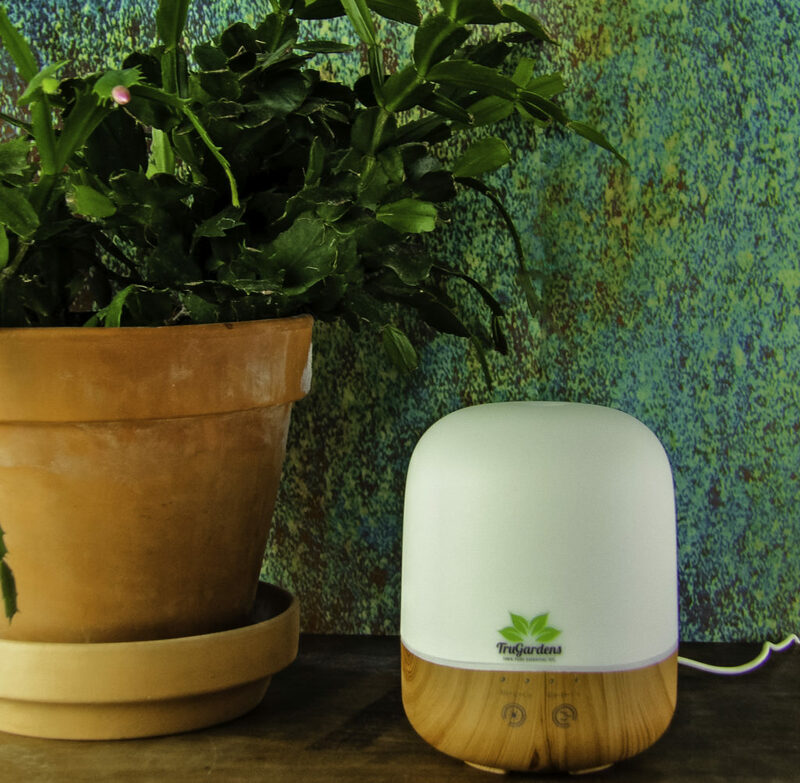 But the real appeal to me of the TruGardens Essential Oil Diffusers is its’ options and safety features. 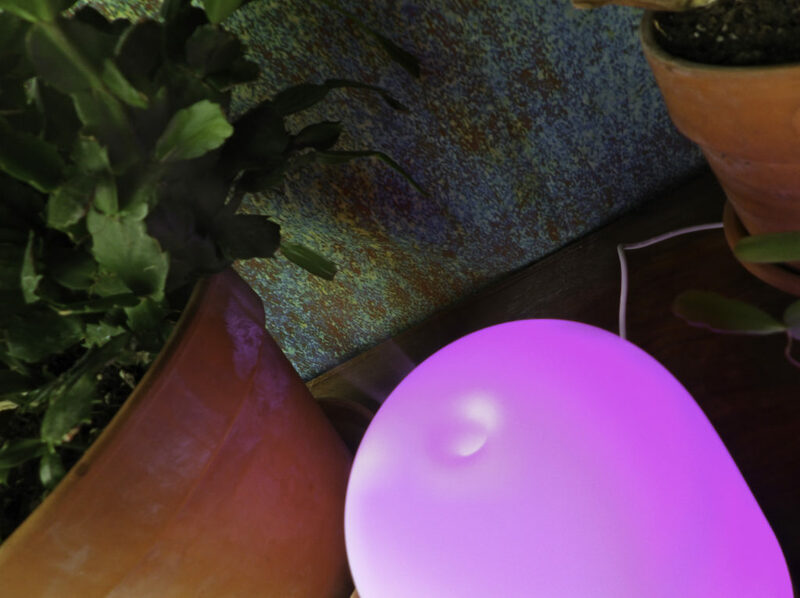 The LED light is optional but adds a soft glow of color to your home or office while diffusing the pleasing aroma. The color choices are selected at the touch of a button, they include soft white light, magenta pink, poppy red, light baby blue, dark blue, and light green. There is also an option to rotate through all the colors as they morph from yellows to golds to orange to red to pinks, magenta, purples, light to deep blues and greens. See the included user manual guide for these settings. Press the left button to change the color of the light, as seen here to blue or one of the other color options. It is bright enough to provide some light at night, but not so much light so as to distract from sleep. The one-touch buttons control the LED light color options and mist. 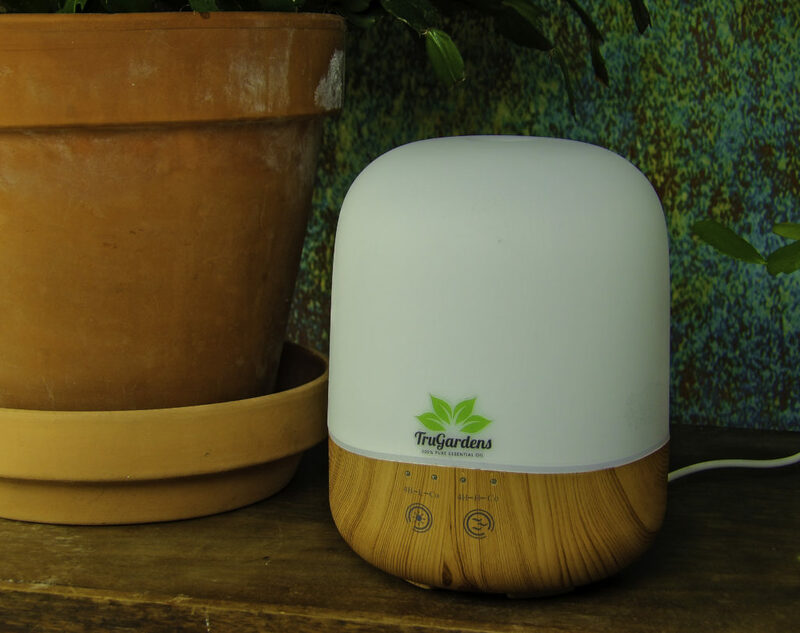 The TruGardens Essential Oil Diffuser has a 300ml capacity or a bit over ten ounces. The fill indicator notes three fill levels depending on your needs ranging from a small office cubicle to a large open room. This provides ample water to run even overnight or for a full workday without having to refill it. 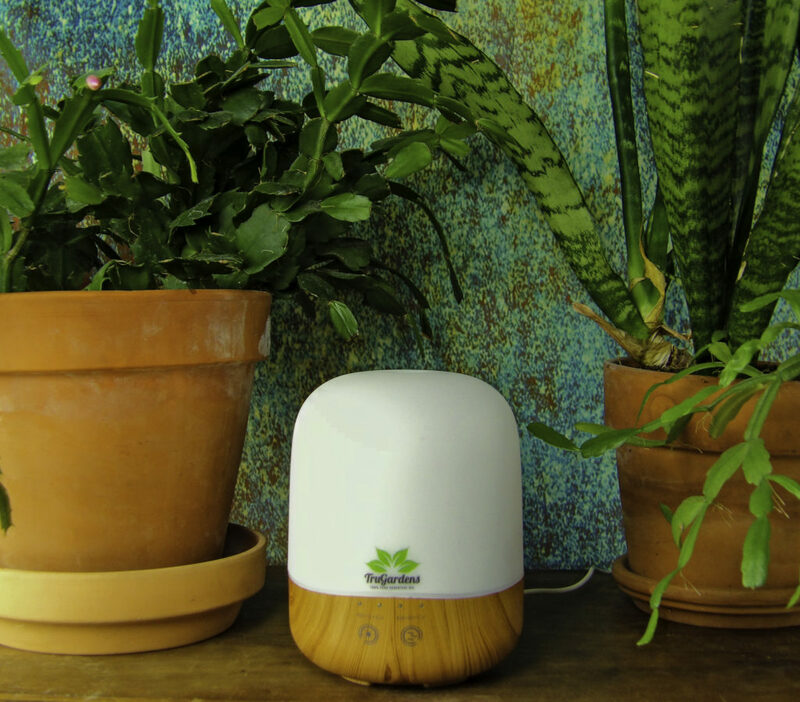 Generally, it only takes a few minutes to remove a stale odor or to infuse even a large room, so the TruGarden Diffuser doesn’t need constant refills yet still has a small footprint on a nightstand, table, or shelf. 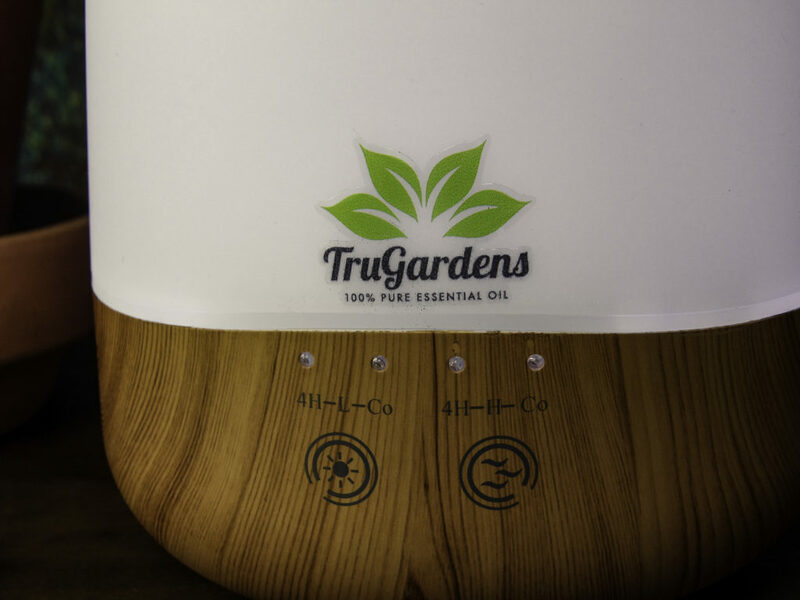 TruGardens diffuser has an auto waterless shut off when the water runs out for added safety. I like this feature as it makes it safe to leave the TruGardens diffuser on overnight, even in a child’s room, or to leave it unattended in the kitchen. I like that if I doze off or forget about it being on, that there’s no danger. It also makes it safe to leave on when I leave the house so I can come home to a lovely diffused scent, which is something I enjoy. Speaking of safety, the TruGarden diffuser comes with CE, FCC and RoH certificates. It makes no noise at ALL, so it is very useful for using at night, or discretely using it diffuse in an office setting. It is so quiet, the first time I used it I wasn’t sure it was turned on until I saw the billow of mist coming from the top of the device. Something I particularly like about the silent feature, apart from making it quiet enough to use while sleeping, is it is also quiet when used in the office. Do you have a workmate that microwaves pungent foods for lunch that permeate the whole office? Discretely diffuse Peppermint or lemon in your office space to eradicate the smell from around YOU. 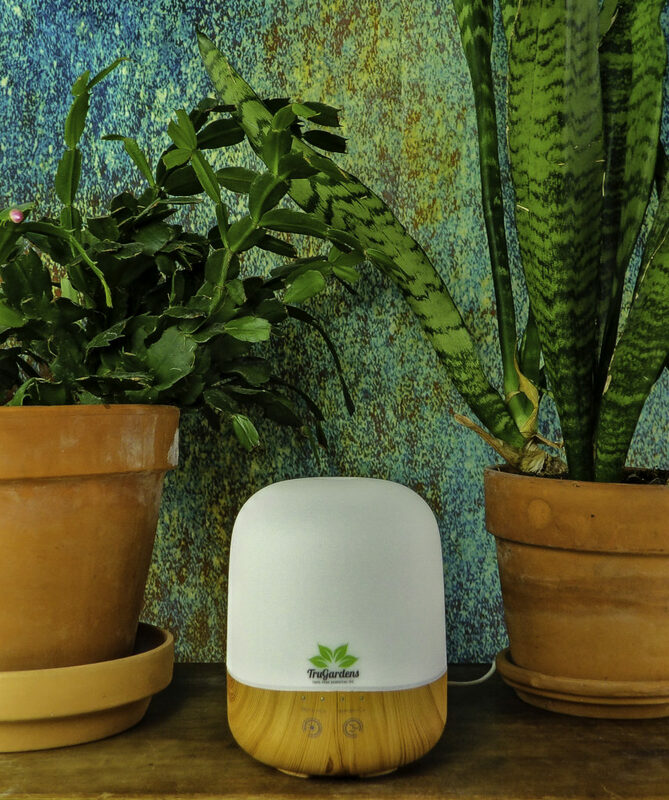 The TruGardens Essential Oil diffuser is so quiet, that no one will even hear it running, meanwhile, your nose and clothes are saved from the smelly meal du jour. 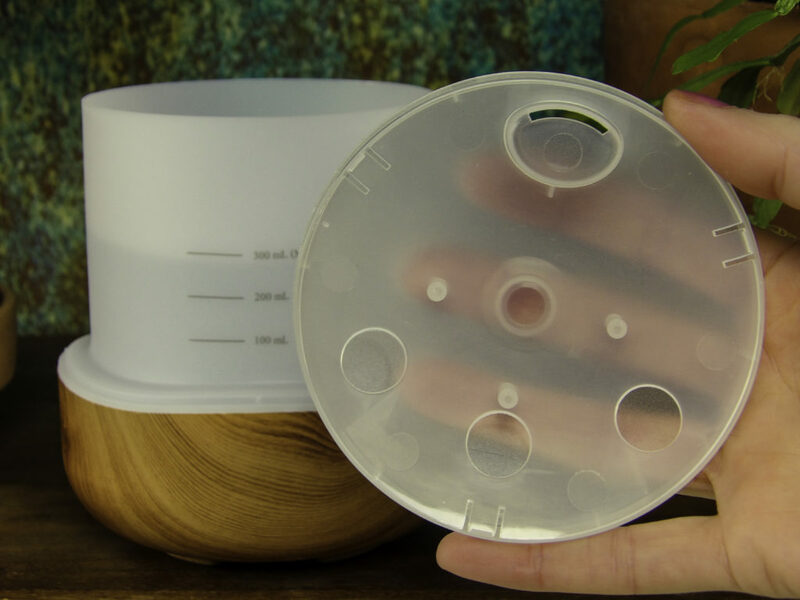 It is also useful if someone is sick in the office and you wish to diffuse some purifying oils, or if you are the sickie and want to diffuse Eucalyptus oil to survive the day without coughing so much you drive everyone else crazy. The moisture level can be adjusted to accommodate a very dry room (such as due to forced air heat during the winter), or for allergies. Of note, the moisture outlet does not sputter, the surface that I had the diffuser resting upon did not become covered with a surrounding layer of wet dew as can happen with some diffusers. With some diffusers I have had to put down a towel to absorb the ring of moisture they leave, but not with the TruGardens Essential Oil Diffuser. This no-sputter feature is in part due to the controlled mist-flow cap that doesn’t allow splashes of water to escape, leading to a very fine mist of steam that easily evaporates into the air. Add 2-3 drops of essential oils per 100ml of water. If the container is filled to the 300ml fill line, use a maximum of 6-9 drops. Peppermint can naturally remove lingering smoke odors, deter mosquitos and other bugs, as well as uplift and invigorate for exercise or other activities. Rosemary Oil can improve concentration and mental clarity while doing homework or working on a mentally taxing project. Lavender can improve relaxation and sleep. Citrus scents including grapefruit, lemon, and sweet orange eliminate cooking smells, even strong fish odors. Some diffusers “burn” the essential oils with overheating to disseminate the scent. 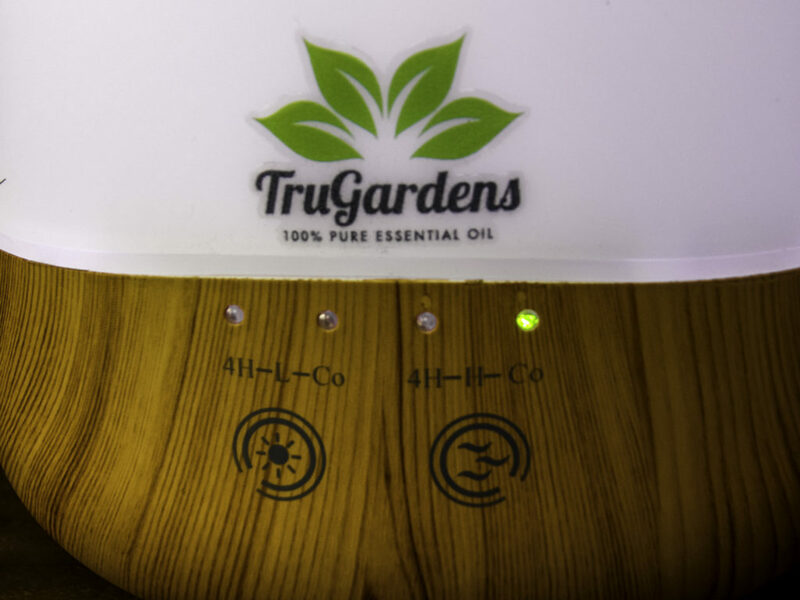 TruGardens Diffuser does not burn the oils. 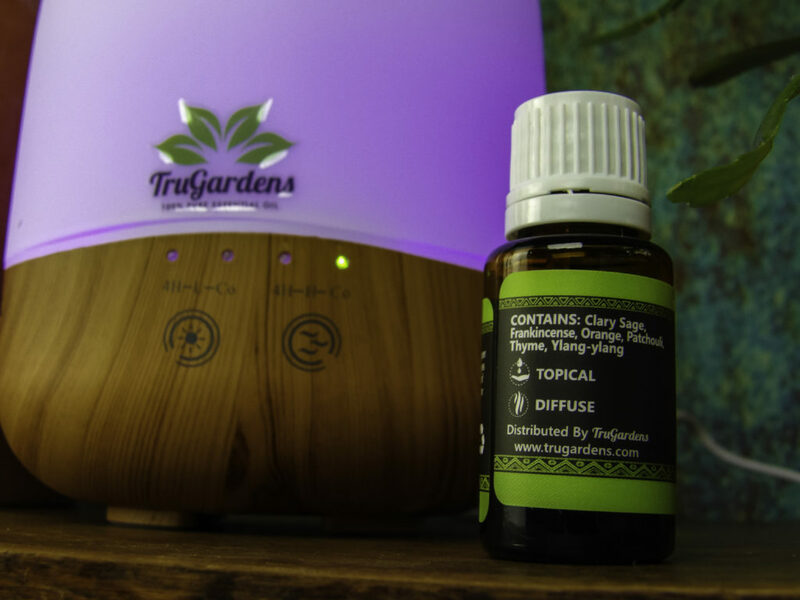 TruGardens also has Essential Oils that work best with their diffusers. 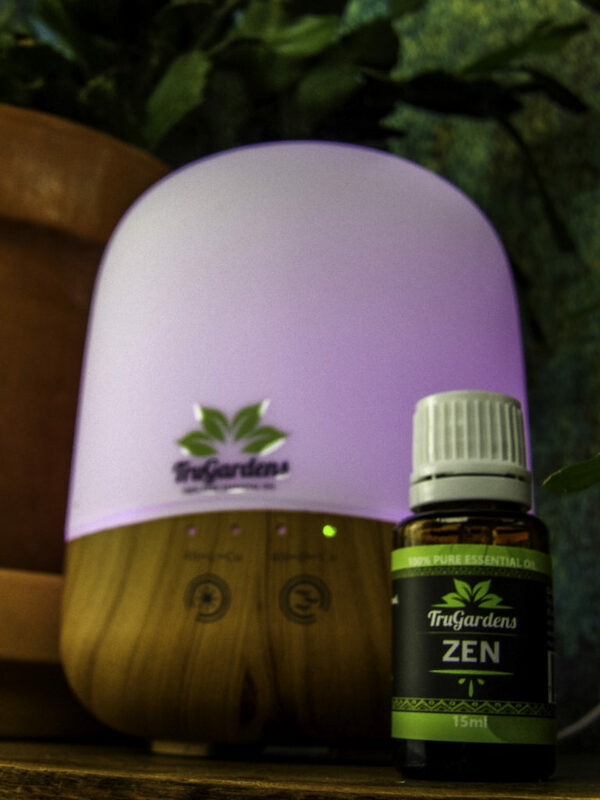 We tried the TruGardens Zen Essential Oil, a pleasant, relaxing scent that is a combination of mind-clearing, relaxing essential oils. Only a drop or two was necessary to diffuse the large open space room near the kitchen with a fresh, relaxing scent ideal for winding down after an exhausting day at work or school. 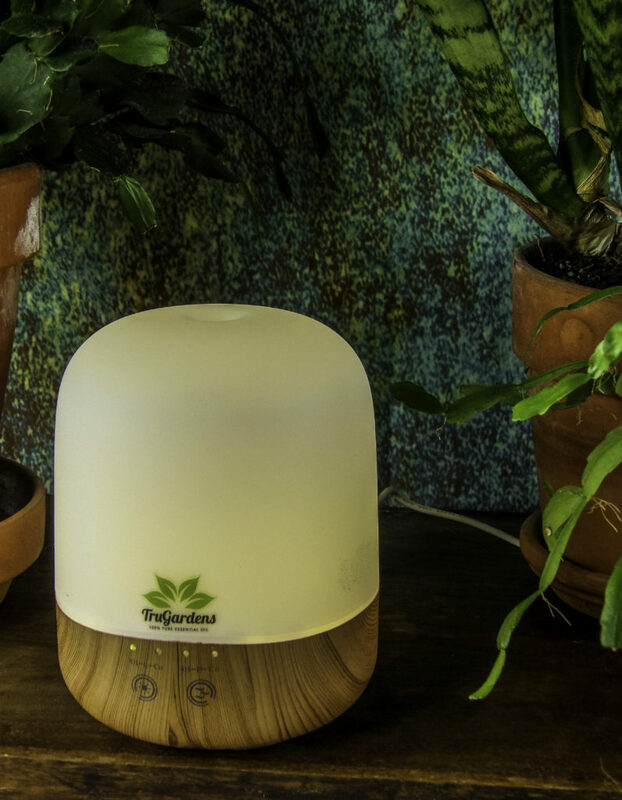 A worthwhile investment in your health and well-being, the TruGardens Essential Oil Diffuser has endless uses to improve concentration while studying, to get better sleep, to diffuse the air to remove smoke, pet or cooking odors, to combat mold, mildew and stale smells, to deter bugs in the home, to help invigorate, lift a mood, to relax, to energize a workout and many more uses. A sturdy diffuser of quality materials and construction, it is easy to use and safe enough for a child’s room. The bamboo makes it fit into both modern and traditional homes as well as being suitable for use in an office. It comes boxed and is suitable for gift giving. 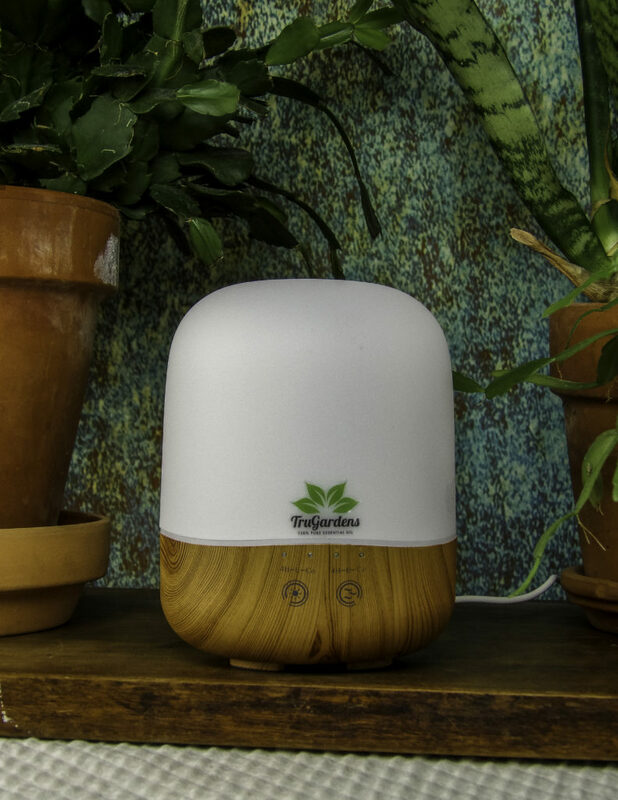 Style Chicks received the TruGardens Essential Oil Diffuser in exchange for our unbiased review and received compensation for our time and effort. However, our experience with the product and the opinions expressed in this review are 100% ours.